This make ahead no-cook, fix-it-forget-it sauce is perfect for topping vanilla ice cream, Greek yogurt or crêpes and pancakes. It can even be served (minus the vanilla bean) alongside pork chops from the grill. Makes about 5 cups. 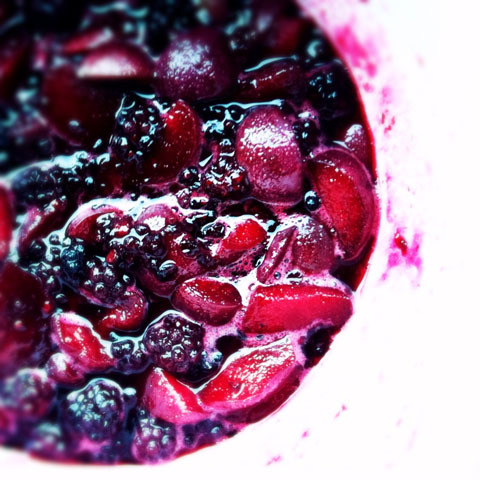 - Combine plums, blackberries and sugar in medium bowl. Scrape seeds from pod and add seeds to fruit mixture*. - Let stand at room temperature until juices form (about an hour), tossing occasionally. Cover and chill. * scraped-out pods can be used to infuse milk or cream with subtle vanilla flavour, or stick them in a jar of sugar to make vanilla-scented sugar.